Feral pigeons (Columba livia domestica), also called city doves, city pigeons, or street pigeons, are derived from domestic pigeons that have returned to the wild. The domestic pigeon was originally bred from the wild rock dove, which naturally inhabits sea-cliffs and mountains. Rock (i.e., 'wild'), domestic, and feral pigeons are all the same species and will readily interbreed. Feral pigeons find the ledges of buildings to be a substitute for sea cliffs, have become adapted to urban life, and are abundant in towns and cities throughout much of the world. Nests are rudimentary, similar to other ground or cliff nesting birds such as turkey, quail, and ducks. Abandoned buildings are favorite nesting areas. Mass nesting is common as pigeons are a community flocking bird; often dozens of birds will share a building. Loose tiles and broken windows provide access, and pigeons are adept at spotting new access points, for example following property damage caused by strong winds. Nests and droppings tend to stay clustered and remain dry when out of the weather. Pigeons are particularly fond of roof spaces. These often contain water tanks. Any water tank or cistern on a roof must therefore be secured and sealed off to keep the pigeons out of them. The popularity of a nesting area does not seem to be affected by the pigeons' population density. On undamaged property, the gutters, window air conditioners and empty air conditioner containers, chimney pots and external ledges are used as nesting sites. Many building owners try to limit roosting by using bird control spikes and netting to cover ledges and potential nesting places on buildings. 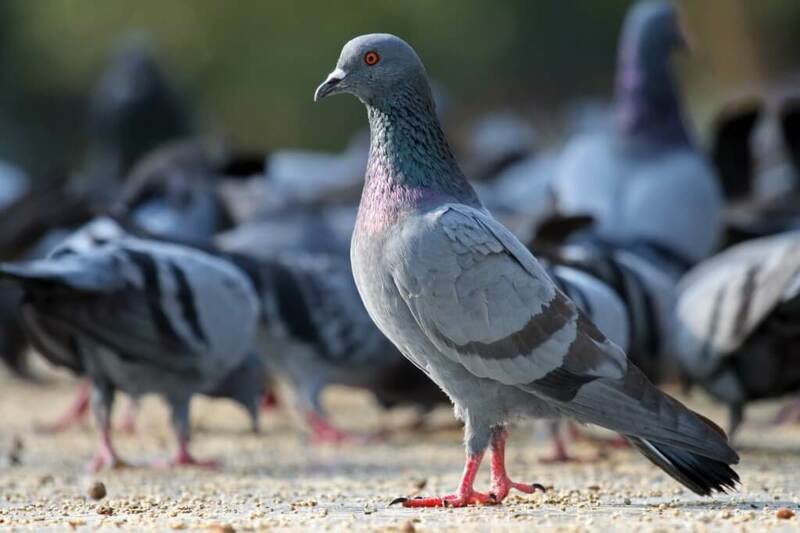 This has little effect on the size of the pigeon population, but it can reduce the accumulation of droppings on and around a particular building location. In the UK, only the larger and more wary common wood pigeon, which often shares the same territory and food supply, will build nests in trees, usually close to roads. Pigeons breed when the food supply is abundant enough to support embryonic egg development, which in cities can be any time of the year. Laying of eggs can take place up to six times per year. Pigeons mate for life, and are often found in pairs during the breeding season, but usually the pigeons are gregarious preferring to exist in flocks of from 50 to 500 birds (dependent on the food supply). Feral pigeons can be seen eating grass seeds and berries in parks and gardens in the spring, but there are plentiful sources throughout the year from scavenging (e.g., remnants left inside of dropped fast-food cartons) and they will also take insects and spiders. Additional food is also usually available from the disposing of stale bread in parks by restaurants and supermarkets and from tourists buying and distributing birdseed, etc. Pigeons tend to congregate in large, often thick flocks when feeding on discarded food, and have been observed flying skillfully around trees, buildings, telephone poles and cables, and even through moving traffic just to reach a food source.